According to a new scientific advisory statement release by the American Heart Association , time spent on "screens" (computers, phones, tablets, video games, television and other outlets) is associated with increased hours of inactivity in children and teens, which has long been associated with poor cardiovascular health and obesity. "The nature of screen time has dramatically changed – while watching television has gone down, overall screen time has gone up. We wanted to see how that would influence patterns of sedentary behavior. Even though we have new screen-based recreational devices now, we are just as sedentary," Tracie Barnett, PhD, an epidemiologist specializing in pediatric obesity and a lead author of the advisory, told ABC News. What age spends the most time on screens? Dr. Nicholas Edwards, a pediatrician and sports medicine physician in Orthopedic Surgery at the University of Minnesota and co-author of the advisory, believes the younger the child, the better it is to start healthy habits – particularly since parents have a greater influence over what they do. "We can do more when kids are younger; it is harder to intervene as they get older," Dr. Edwards told ABC News. Suggestions include removing televisions and recreational screen-based devices from bedrooms, and keeping them away during meal times. Parents can encourage outdoor activities and device-free social interactions on a daily basis, and model those habits for kids. Screen time can be regulated, and parents should know that their own screen behaviors are important. Enforcing regulations works – it is okay to put limits at home. Parents should reinforce the alternatives: face-to-face interactions, play time, outdoor time. "There should be no recreational screen time under 2 years of age, no more than 1 hour under 6 years of age, no more than 2 hours over 6 years of age," according to Barnett. "Overall, recreational screen time use has been increasing. Every family and child is different, but moving more and staying more active is better," added Dr. Edwards. 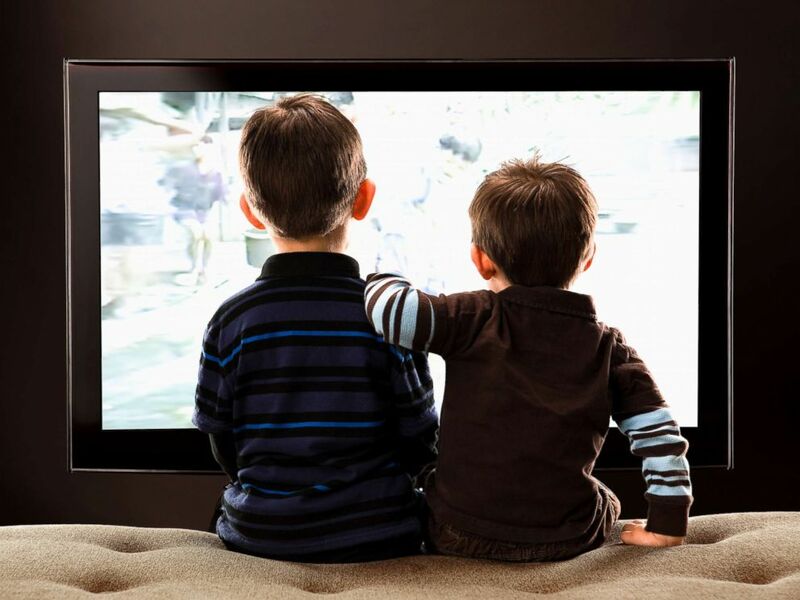 Two children watch television in this stock photo. The patterns of screen-based media use and their long-term effects on children and teens just aren’t known yet. "Technology is moving faster than research, therefore this is an area that needs to be studied further," according to Dr. Edwards. There’s not much research on how to help kids be less sedentary, screens are very appealing, and getting their attention to go somewhere else is challenging. "Screens are ubiquitous, but reinforcing and respecting some strategies and rules at home that everyone can adhere to really works,” Barnett said. "It is encouraging that some technology companies have recognized the need for both parents and children to set limits, introducing options for parents to put limits on when their children can use devices and expanding on these capabilities," Dr. Edwards stated. The connections linking screen time to cardiovascular health and obesity are unclear, but doctors are concerned that screens might influence eating behaviors. For example, children may not notice when they are full when eating in front of a screen. There is evidence that suggests screens disrupt sleep, and that’s known to increase the risk of obesity. "The core message is to 'sit less and play more – just move,'" Dr. Edwards said. And parents need encouragement. Sometimes it seems as though technology is too widespread to control, but setting guidelines can make a huge difference with kids.